At many Bay Area restaurants, chefs put the petals to the metal. At eVe, flowers enhance the element of surprise. Because they're beautiful, eating flowers seems so wrong. Because they're beautiful, eating flowers seems so right. A Victorian favorite and a Persian standby, floral cooking is back — big-time. From chive-blossom soufflé to lavender lemonade, flowers are the new fruit. Some of the East Bay's top chefs shared their favorite ways of using blooms: Do try this at home. 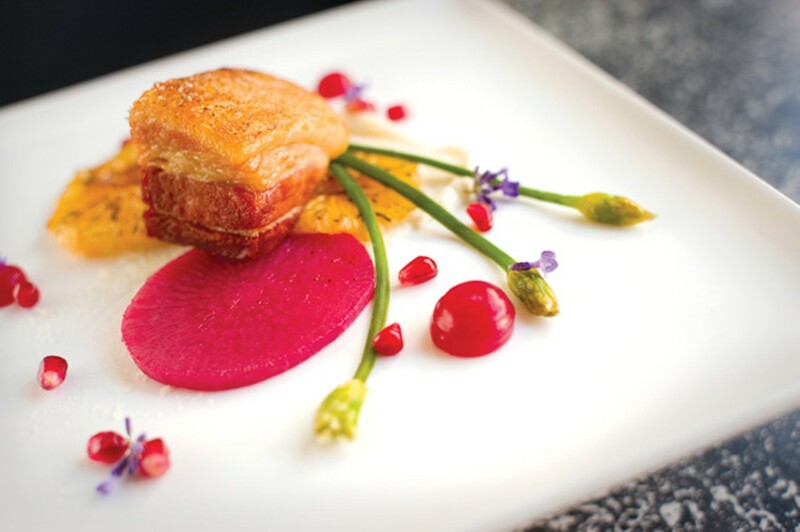 "I'm not a big fan of flowers just for the sake of flowers, where they're used just for a visual effect," said Jared Doob, who became the executive chef at Oakland's Lake Chalet this summer. "Every ingredient in the food I cook has to mean something and contribute to the dish in some way." That's why, when making salads, Doob prefers nasturtiums over pansies. "Nasturtiums have that nice peppery flavor," said the chef, who uses their vivid yellow-orange petals in tuna Niçoise. Having spent six years as the chef at San Francisco's Restaurant Lulu, Doob said, "I'm a big fan of lavender. At Lulu, there was a law: If it wasn't found in Provence, it wouldn't be on our menu." Lavender grows magnificently in that southern French region; it's one of the herbs in herbes de Provence. Doob uses it in marinades, sauces, and butters for grilled steak, and with prawns poached à la nage: Because lavender's so potent, just one teaspoonful is enough for twenty orders of this dish. Most flowers are milder. Doob juliennes whisper-thin squash blossoms into mixed green salads, "and there's that classic preparation of stuffing squash blossoms with the squashes themselves." He sautées zucchini with ricotta cheese and fresh herbs, then stuffs it into the tubular blooms. He's also a fan of the electrifying, mouth-numbing buzz button, aka Szechuan button. This marble-sized, frizzy yellow bud of Spilanthes acmella, a member of the sunflower family, is used for toothache relief in traditional Asian and indigenous South American medicine. Doob sprinkles it into salads and sorbet bases. Don't say you weren't warned. At eVe in Berkeley, husband-and-wife chef/restaurateur team Christopher and Veronica Laramie are seriously into molecular gastronomy, the scientific riff on cooking that produces foams, spheres, and pyrotechnical edible artistry. For the Laramies, who met as students at Le Cordon Bleu in Paris, flowers enhance the element of surprise. 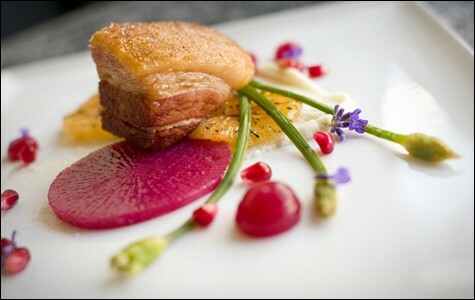 A pork entrée at eVe, whose rose-garden patio opened on September 25, includes chive blossoms, pomegranate seeds, grapefruit peel, pink-centered watermelon radishes, and pork that has undergone the sous-vide method — ten hours vacuum-sealed in airtight plastic bags, immersed in hot water — then pressed overnight, then deep-fried. "The chive blossom is super-oniony," Veronica said of the spiky purple puffballs that can be sautéed, infused in vinegar, and eaten raw. The flowers of most produce — including arugula, herbs, and fruit — are underappreciated, the Laramies assert. "Most people see the blossom at the top of the chive and just chop it off," Christopher marveled. "But we're excited to see it. We shock the blossom in the oven for a couple of minutes, then torch it for a little burned flavor" before adding it to the pork dish. They have also paired chive blossoms with pork and Buddha's-hand citron, and they make a goat's-milk/nasturtium/apricot panna cotta. Sweet, spicy flowers are a natural match for chocolate. At the Xocolate Bar on Solano Avenue, chocolatiers Malena Lopez-Maggi and Clive Brown stuff truffles with lavender and with elderflowers in the form of Thatcher's elderflower liqueur. Brown has also devised a cherry-hibiscus truffle. "Hibiscus is a dry flavor with a little tang," mused Brown. "Cherry is earthy. It's like putting together high notes and low notes." Brown pushes the envelope even farther with fennel truffles. "We use the fennel flowers from out back," he said, gesturing toward the lot behind the shop. Fennel grows wild there as it does all over the East Bay. Although its fronds and bulbs are by far more familiar, its flowers — jutting from the bushy plant like tiny yellow constellations — have lent an almost-anise touch to sweets and savories for millennia. The ancient Roman gourmand Marcus Gavius Apicius wrote enthusiastically of a 1st-century-CE meal featuring flour-dipped, green-sauced fried frogs: "The fennel-blossom garnish is a startling stroke of genius," Apicius raved. Next door to Xocolate, the Tangerine Bar serves hibiscus lemonade. Floral drinks are universal refreshers, from jasmine and chrysanthemum teas to hibiscus margaritas to gingery Jamaican sorrel and Mexican jamaica, both hibiscus-based. At Masse's Pastries in Berkeley's Gourmet Ghetto, baker/co-owner Paul Masse uses candied violets to top the occasional cake — "but only the French imports." Both whole violets and petals are available, but Masse prefers to use petals because they allow for a lighter touch, which he says is crucial when using flowers — even in desserts. He's especially leery of lavender. "I find its flavor a little soapy, maybe because I'm so used to smelling it in soap," he said. However, because others enjoy it, he sometimes uses lavender to infuse crème anglaise and crème brûlée. "But since I'm not crazy about it, I only use a little bit. For eight crème brûlées, I might use just one or two flowers." As another nod to French baking, Masse uses orange-flower water in all of his short dough and tart dough. "It's very subtle," he said. "No one even knows it's there." Yet it conveys an ever-so-faintly aromatic brightness. Masse sometimes uses rosewater in macaroons, but cautions people to "be careful" with rosewater. "It sounds a little better than it tastes, and it looks a little better in those pictures in the magazines than it tastes," he said. "It's very easy to use too much in a dessert. I liken it to an elderly woman who uses too much perfume. Orange-flower water is a lot less potentially offensive, especially when it's coupled with vanilla." At the Meritage Restaurant at the Claremont Resort and Spa, executive chef Josh Thomsen has just put four dishes containing lavender onto the dinner menu: roasted Sonoma chicken breast with chanterelles, pumpkin, lavender agnolotti, and lobster emulsion; lavender lamb loin with toasted-almond foam and chocolate red-wine sauce; roasted Sonoma Muscovy duck glazed with lavender honey and spices; and brie and apple mini-paninis with lavender honey. "It certainly can be overwhelming," he said. "It's not like you should open the sachet bag from your underwear drawer and sprinkle it into the pan. Rather, it's a matter of cooking with small amounts of it for an elongated period of time and putting it into the right dishes that will bring out its flavor. "I prefer to have its flavor involved in things without being broadcast, so that I can enjoy it without really expecting it. One way to do this is with a beautiful lavender honey." For the lamb dish, he warms lavender in olive oil "very gently, so that the oil takes up its flavor," then adds this to the marinade. "Oil is a delivery mechanism for whatever you infuse in it," said Thomsen, who recently started a garden on the Claremont's grounds where he plans to grow organic produce, herbs, and edible flowers. For his lavender agnolotti — the Piedmontese version of ravioli — lavender enters the pasta machine along with eggs and flour, slightly perfuming a savory dish. At Oakland's Ozumo, executive chef Yo Matsuzake makes chrysanthemum chawan-mushi, steaming petals with the egg mixture to give the resulting custard "a refreshing bitterness." While flowers serve mainly as garnishes in traditional Japanese cuisine, Matsuzake — who trained in French restaurants — reflects the contemporary Japanese flair for fusion. That's what inspired the hibiscus syrup that he plans to serve with duck breast at Ozumo this winter. He also puts cucumber blossoms and ume plum blossoms into sushi and onto sashimi. "We use just small delicate bits," he said. "We don't want to overpower the dishes, just to give them a tiny something extra." During cherry-blossom season, Matsuzake makes sakura mochi, steaming the delicate blossoms with sticky rice that takes on their aroma and turns pink. Each finished mochi is wrapped in a cherry leaf. Hibiscus blooms all year. Chrysanthemum season starts in three, two, one ... .